Some winches are more difficult to service than others. If you do not know what to expect, certain parts, depending on manufacturer, can come sliding out at inopportune times and jump overboard! i happen to know this from personal experience and if you are really unlucky (like I was) then it may be a part from a vintage winch for which they no longer make parts… woops! 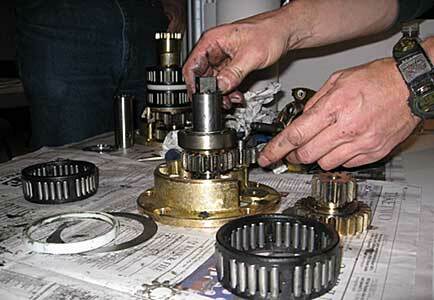 Like anything else, there are varying techniques when it comes to servicing winches. Let me try and see if I can explain a simple method that I personally like to use. 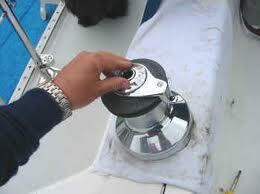 First, I would try and get some sort of manual or diagram of the winch you are trying to service or disassemble. The internet can be a really useful tool for this. In removing the winch drum, depending on the winch you have, you are looking for either a single screw down inside the winch handle socket or a split ring which sits on top of the drum and encompasses the winch handle socket. Andersen winches like to use three Allen Head screws that also hold the lifter on. Newer Lewmar winches will have large threaded washer which sits on top of the self tailing unit (pictured above). Some older model Lewmar winches will need the self-tailer disassembled in order to remove the drum. 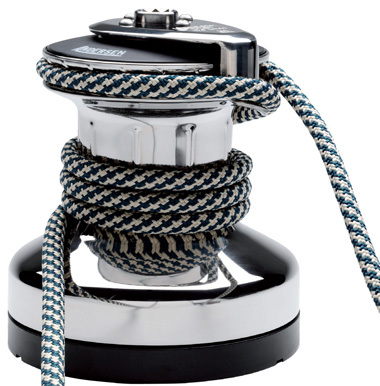 These methods should release the drum on most winches made within the last 20 years or so. Again, your best bet is to always look online for a technical diagram for your winch. The trick to servicing any winch is to do ONE AT A TIME! All of the parts within a winch are usually specific to their location. Which means most of the time the winch will not allow you to put it back together improperly. Although taking pictures as you are doing this can’t hurt. So now that the drum is free, try and slide it up gently and carefully. Some winches have Delrin or bronze key-ways that are let into the winches spindle or body that will need to be removed to completely slide the drum up and off. These can be tedious and require patience. Before you lift the drum off completely slide your hand under the drum to catch any parts or pieces (like bearing sleeves) that may be stuck to the inside of the drum and like to come sliding out when you least expect it. Next, we should be looking at the internal workings of the winch. 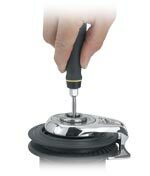 Slide off and remove any pins, gears, washers, and spacers that are removable. From here depending on what winch you own, you may need to remove the winch completely. I know nobody wants to actually unbolt the winch, but if it hasn’t been serviced in the last five years or more, I would definitely recommend to go all the way and service the winch completely. So how do we ‘de-gunk’ all of these parts? Well, this is the difference in my method vs. others. Generally you will see people use a tub or a parts washer and use either kerosene, mineral spirits, diesel fuel, or the like. This makes one heck of a mess, can be bad for you, and it stinks! 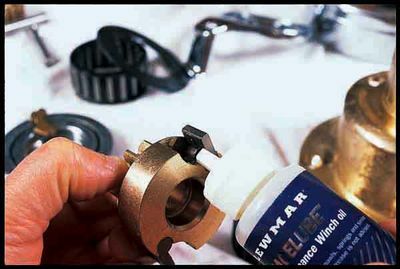 I like to use good old WD-40 and a roll of paper towels, it de-greases, cleans, lubricates and dissipates moisture. Not only that, it also comes in a handy-dandy spray can so I can show up at the boat with just a fresh roll of paper towels, a can of WD-40, a cardboard box for my trash, spare pawls, springs and some gear grease. I will lay out a paper towel next to the winch I am working on and clean each and every part as I remove it and lay it on the paper towel. 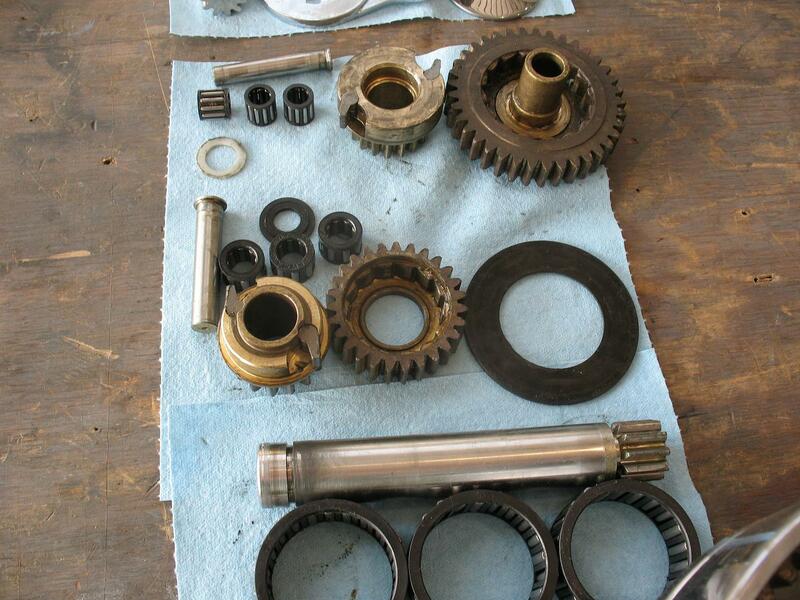 After all of the internal workings have been thoroughly cleaned and inspected including the inside of the drum and all non moving parts; I reassemble the winch completely and carefully, then grease all of the gears, bearings and the spindle, ONLY. NEVER GREASE THE PAWLS! For the pawls WD-40 is all you need, you can opt use 3 in 1 oil or pawl oil for them, but never grease. I will Make sure all pawls and springs are in good working condition and that they have nice action. If not, I replace them with the spares that I have. The key to winches is, I’ll say it again, DO ONE AT A TIME. Re-assemble the winch carefully and if it is not going together correctly right away, then take it back apart and try again! Remember you need to be patient, but do not put it back together if you think it is wrong. Instead ask your local rigger for help. Hope this helps and leave a comment if you have a question. This entry was posted on 10 September , 2014 by metbob2. It was filed under Uncategorized .